Arrive at Indian Pass Marina 9 am EST. Will bring kayak and lunch. Objective: paddle across pass and hike to redfish pond. Suitable footwear is advised. My dad, who goes by T.R., has a reputation in our family for only having an interest in activities that are either completely miserable or potentially life-threatening. For a very long time, I was one of the few people who could not say “no” to his adventure proposals. Even though his idea of fun often ended with me being in tears the entire return-leg of the excursion, looking back, I’m always happy that I joined him. One of his favorite places to go is St. Vincent Island. When I lived in Florida, it was a two-hour drive from my home in Panama City Beach to Indian Pass, a small community on the mainland where we would meet. The trip arrangements, like most of the communication in my family, were always made through email. It would be a day trip for both of us. I would meet him mid-morning so we would have enough time to make the most of the day and still be able to make it home that night. St. Vincent is a barrier island and wildlife refuge on the Gulf of Mexico in Franklin County, Florida. I’m sure it appeals to my dad because of its remoteness and strange history. Before my mom’s death, during the time she was bedridden and ill, my sister, dad, and I all dealt with our grief and anger in our own ways. For my dad, it was making a conscious decision to live life to the fullest, always seeking out the greatest adventure, and appreciating one’s history and roots as a way to create a sense of pride and identity. One thing I learned from him is that if you look back far enough, every place has its romantic mysteries. A person doesn’t need to travel to the other side of the world to be in an amazing place. For my dad, St. Vincent Island is another world, although it’s only a three-hour-away drive away from his house in Alabama. The island is only accessible by boat, and a shuttle will occasionally ferry passengers across from the Indian Pass Campground and Marina. A few brave tourists will venture across on the shuttle with their mosquito repellent and grocery bags for collecting shells on the beach. I’ve been to the island with my dad about a dozen times, and we rarely see anyone else there. We park at the marina, launch our kayaks from the beach, and paddle to the island across the swift-moving current that flows through the pass. We head straight across towards the weathered old boat house and drag our kayaks up on the beach by the dock where the shuttle ties up to let the tourists disembark. 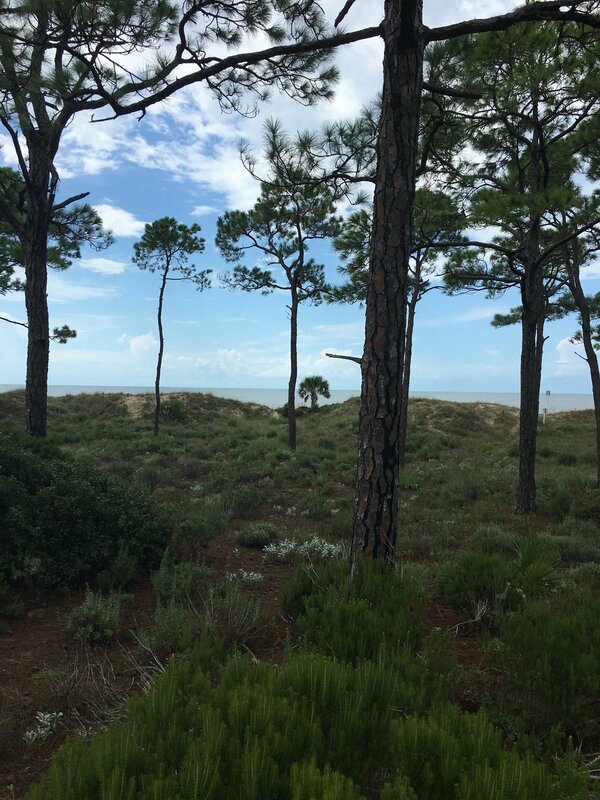 Although covered in dense scrub oak groves, clusters of low-lying palmetto palms, and tall, yellow pines warped by hurricane winds of the past, the state has made it easy to traverse by constructing a grid of shell-paved road beds across the island to help contain controlled burns. We would usually pull our kayaks up onto the beach and hike across the island following one of these roads. This is the easy part. There is very little talking during these hikes. We don’t want to ruin our chances of seeing wildlife. The island and portions of the nearby mainland have been a National Wildlife Refuge since 1968. At the beginning of the 20th century when it was still privately owned, exotic sambar deer were imported from the far East. Their long-living, Asiatic descendants have thrived in the wetland habitat, competing with their much smaller native cousins, the white-tailed deer. These ancient giants also share their home with a large community of feral pigs, called piney wood rooters by the locals, and various endangered species such as bald eagles and loggerhead sea turtles. A small red wolf population was introduced to the island in 1990 as part of a propagation program. I’ve never seen a red wolf on the island, although I’m sure they have seen me. The shell-paved road bed ends as we reach the beach on the gulf side. The waves are crashing onto the sand, crushing broken pieces of shell into smaller, smoother bits that give the beach its grainy, peppered texture. I always find more driftwood, dried seaweed, and shells than I can carry back. On one occasion, I found what looked like a severed tentacle–a purplish color and about four feet long. Because of the island’s remoteness, there is very little trash. Any man-made debris, such as fishing nets, pieces of construction material, or plastic bottles, is usually deposited on the island by high tides during a tropical storm. We walk along the gulf-side beach for several miles, until we return to the bayside of the island where we left the kayaks. By the time we walk back, our pant legs are soaked up to our knees, there is gritty sand rubbing into blisters on our feet, and our hips hurt with a strange sensation caused by every footstep sinking three inches into the soft sand. The island’s story pre-dates history. Cross-hatched pottery shards made by people of the Weedon Island culture over 7,000 years ago, are scattered on the bayside beach. In the early 1800’s, William Augustus Bowles, an infamous figure still celebrated by Fort Walton Beach’s annual Billy Bowlegs Festival, headquartered a pirating operation from St. Vincent, running a small fleet of ships manned by separatist Creek Indians and runaway slaves. Bowles and his gang would loot merchant vessels and Spanish ships travelling through the Apalachicola Bay. There are rumors of local beachcombers finding Spanish doubloons in nearby salt marshes and bayous during low tide after storms have passed, and a legend of a Spanish galleon that was dragged by a hurricane across St. George, a neighboring barrier island, leaving behind a trail of silver coins in its path. It’s easy to imagine the possibility of stumbling upon treasure washed ashore while walking along one of the island’s deserted beaches. These are my dad’s favorite stories to tell me as we walk along the beach. St. Vincent is part of the Florida coastline known as the “Forgotten Coast.” This area, reminiscent of “Old Florida,” stretches along the panhandle, beginning around touristy Mexico Beach and ending somewhere along the quaint fishing towns of Panacea and Alligator Point. It reminds my dad of his childhood, when a trip to the beach meant staying in mom and pop run hotels, playing goofy golf, and eating at hole-in-the-wall diners–long before MTV’s spring break came along. It’s the kind of “Old Florida” that Marjorie Kinnan Rawlings wrote about in Cross Creek and The Yearling. He says the only reason people go to places like Destin is to see people and be seen. The island is just one of the many remarkable sites in the area. Surrounded by cypress swamp floodplains, the alluvial terrain is rich in diverse wildlife. The Apalachicola River flows into the bay slightly northeast of St. Vincent Island, creating a brackish estuary where tupelo trees and oyster reefs flourish. This has created a paradise for sport fishing. It is also the perfect habitat for diverse species of sharks, residing in the murky water, and occasionally venturing up the river. This makes the trip across the pass by kayak back to the mainland even more exciting. I can’t help but think about what might be swimming along beside me as I paddle, invisible, only a few feet away. By the time we have paddled back to the camp site where we parked, after all of the hiking in wet shoes, we are hungry, exhausted, and a little miserable. But soon, I forget the discomfort, and I feel thankful for the adventure and escape into another world, even if it was just for a day. Anna is a native of southeast Alabama, but has spent a third of her life on the Florida Gulf Coast. She is currently a M.A. English candidate at the University of Tennessee Chattanooga where her research includes the rhetoric of wonder in 19th century natural history writing, an interest that developed over the past decade through her involvement with the Bartram Trail Conference. Three years ago, she traded in spring breakers and snow birds for an old house overlooking the Scenic City where she lives with her husband and a mutt named Digby.